Last evening I experienced one of the tremendous joys of blogging! 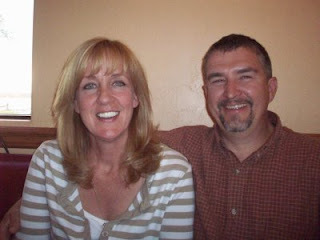 This dear couple (www.much2ponder.blogspot.com) were in my area and because we have been blogging friends for about a year, they contacted me and we were able to meet, laugh, share our Jesus, and just enjoy His presence together. It was so precious! Thank you dear ones for coming and for sharing with me even through your tiredness of travel. It is so true that in the Body of Christ, there are no real strangers. To never have meet before except through the blog and facebook, then to really meet and share the sounds of voice and laughter, was a special privilege. In Jesus there is a unity of Spirit the world cannot touch. It just is. My heart is blessed and my spirit is soaring in the privilege of meeting and enjoying them. The Lord delights in giving us such special gifts! I think it is called grace. Thank you for those prayers! We had such a sweet time. Their love for you, each other, and His people is very apparent. You have fostered such love in them. Thank you, Pastor, (and Ken) for modeling this truth in their lives. Iris, thanks for sharing this piece. "It is so true that in the Body of Christ, there are no real strangers." (((Iris))) it truly was a blessing on our end as well. Your kind heart and words did not fall on deaf ears. We were both listening and have come away with a new peace in our spirits as to our walks with the Lord, where he has brought us from, has been with us in the process and were we are headed. Thank you for bringing much needed words of confirmation as well as encouragement to our hearts. We appreciate you more than you know. You are a blessing sweet friend. I look forward to another trip and anticipate another wonderful meeting with you. You are loved.